in the ginger family. Rhizome has a tough brown skin and bright orange flesh. Ground turmeric comes from fingers which extend from the root. 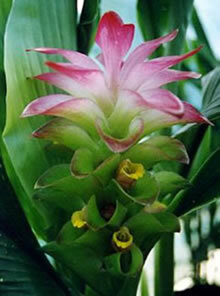 There are approximately 30 varieties have been recognized in the type of Curcuma in which turmeric belongs. Amalapuram, Armour, Dindigam, Erode, Krishna, Kodur, Vontimitra, P317, GL Purm I and II, RH2 and RH10 are some popular Indian varieties among them. In India most of the turmeric used is of dried cured variety, the 'Erode' variety is the best and more popular. The 'Krishna' variety gives the highest yield of green turmeric. Curcuma longa is the most important economically accounting for about 96% of the total area under turmeric and the remaining 4% is under C. aromatica grown in some small district of Andhra Pradesh and Tamilnadu. Duggirala, Kodur type, Tekurpet, Mydukuru, Sugantham, Alleppey, Kasturi and Kesar are some other commercially popular varieties. Duggirala type has larger rhizomes of good quality and is more suitable for heavy black soils. Tekurpet’s rhizomes have good colour and higher curing percentage. Mydukuru type has a higher yield potential than Tekurpet but poorer in curcumin content. Kasturi and Kesari types are fairly good in curcumin content. Some of the important high yielding varieties of Turmeric in India. Amruthapani: Medium duration crop (8 months) highly resistant to leaf-spot but susceptible to leaf-blotch. Armoor: Long duration crop (9 months), resistant to leaf-blotch: popular variety. 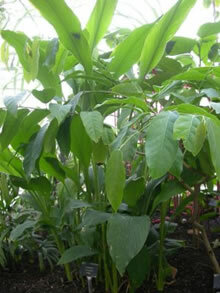 Duggirala: Long duration crop (9 months); tolerant to leaf-blotch; major regional variety. Tekurpeta: Long duration crop (9 months); resistant to leaf-blotch, popular variety. Pattant: Reportedly better colour and aroma of varieties grown in region. Alleppey: High colour variety; generally marketed as Allepey turmeric. Wynad: Marketed as Alleppey turmeric. Perianadan: Major regional variety; generally marketed as Madras type.